Oregon Scientific SA218 Smart Anatomy - Interactive Human Body features a cool and colorful design. 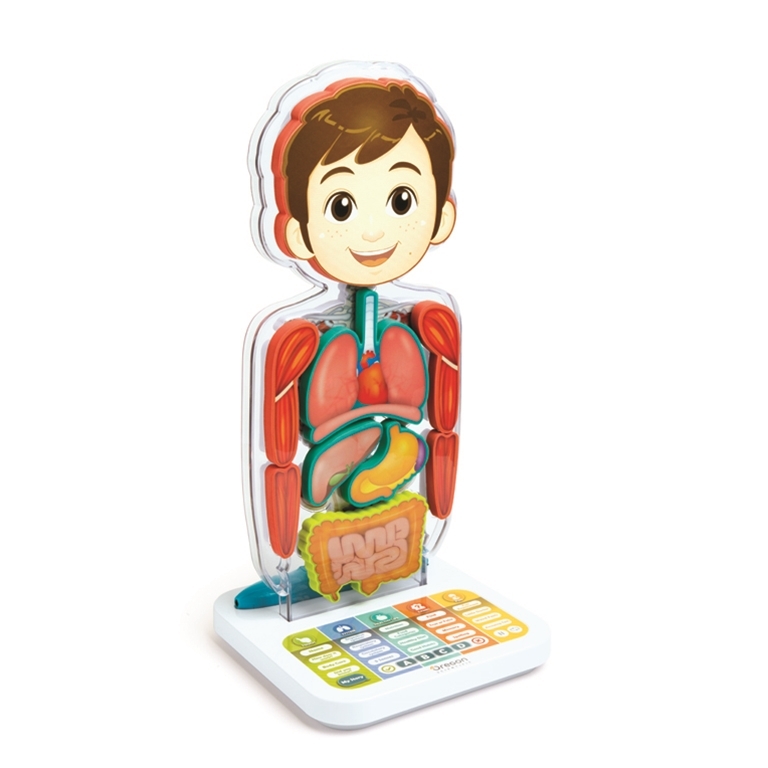 The Smart Anatomy makes learning about the human body fun and easy! It holds a wealth of information covering topics as diverse as organs, bones, muscles, nutrition, healthy habits and much more! The wireless Smart Pen technology helps you learn about the complex systems in our body by simply touching the detachable body parts with the tip of the Smart Pen with 16 Detachable body parts with OID codes, that are both soft and super easy to handle. It also includes an A3 size poster and A5 size book with addition information of the human body. Plus information to help make the right choice to maintain a healthy body and well balanced lifestyle. Packed with 20 exciting activities in 5 game modes, there are hours of informative audio content, giving endless educational entertainment with amazing facts about the human body. How to hold the detachable parts on the body? The detachable parts use small magnets to attach to the body base. Is there any interaction between the body and the book? Yes, when playing with the book, the user will have the opportunity to play some activities that require him to touch the different parts of the body to answer questions. Is there different levels of learning in the games? Yes, it is possible for the parents to choose the appropriate content for their kid. Depending on the chosen level, the content that will be played will be slightly different and adapted the kid’s age. How many players can play simultaneously to the games? Up to 4 players can play simultaneously to the games (doesn’t apply to all activities).